North Walsham TownThe market town of North Walsham makes an idea base for both boating trips and seaside holidays - it's just a few miles from the golden sands of northeast Norfolk in one direction, and the gentle waterways of the Norfolk broads in the other. 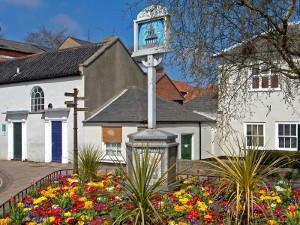 The focal point of the town is its unusual market 'cross', a tollhouse for market traders dating from 1602. It is a fitting landmark in a town that has been a centre of business in North Norfolk for hundreds of years. The Church of St Nicholas sits in a sanctuary at the heart of the town, erected in the mid to late 14th Century at the height of the medieval wool trade that made wealthy communities out of North Walsham and the neighbouring village of Worstead (from which the tightly-spun cloth takes its name). Despite the size and opulence of the town's 'wool church', there is a glaring idiosyncrasy: its tower is a ruin. In the early 18th Century a spire was added to the already soaring tower, making it 20 feet taller than Cromer's lofty effort. But in 1724, the story goes, a stiff wind combined with a particularly energetic bout of Ascentiontide bell-ringing to set the tower aquiver and send it crashing to the ground. Such histories course through North Walsham's lifeblood. One of Britain's most talismanic characters, the naval hero Horatio, Admiral Lord Nelson was educated at Paston Grammar School (now Paston College). The market town of North Walsham makes an idea base for both boating trips and seaside holidays - it's just a few miles from the golden sands of northeast Norfolk in one direction, and the gentle waterways of the Norfolk broads in the other. The school itself was founded by Sir William Paston, late 14th and early 15th Century scion of the gentry family whose daily lives and endeavours were chronicled in the Paston Letters - one of the most important records of medieval life in England. Such is its significance that this astonishing hoard now resides, for the most part, in the British Library with parts of it also in Oxford's esteemed Bodleian Library and at colleges at Oxford and Cambridge.